Travel to the Sacellum of Boethiah and speak to the Priestess of Boethiah. Sacrifice a follower on the Altar of Sacrifice. Kill all the cult members. Go to Knifepoint Ridge and kill Boethiah's current champion. You can start the quest any time after reaching level 30, either by reading a copy of Boethiah's Proving or traveling directly to the Sacellum of Boethiah and talking to the Priestess of Boethiah or killing every one of the cultists. If you wait, you may be attacked randomly in the world by Boethiah cultists, who will have a copy of Boethiah's Proving on their corpse. Note: See Boethiah's Proving for other locations of the book. The various copies of the book appear once you reach level 30. First, you will have to make your way to the Sacellum of Boethiah. Follow the road northeast from the Windhelm Stables up to Traitor's Post. Nearby is a road that leads into the mountains, up to the Sacellum. When you arrive at the Sacellum you will find two cultists fighting in a small arena. There are some more cultists and a Priestess of Boethiah watching them. Speak to the priestess. She will tell you that you need to prove that "your tongue can wield a lie". If you kill the followers of Boethiah, the Daedric Prince will appear and give the quest instructions herself. The priestess will tell you that you need to gain someone's trust and then sacrifice them before Boethiah. She will give you the Blade of Sacrifice to use for the deed. Lead any non-essential follower to the shrine and activate command mode (holding 'use' or via the "I need you to do something" conversation option). Highlight the pillar and you should see "Use the Pillar of Sacrifice". Tell them to do this and they will move towards it and be pulled in and stuck to it. If the follower is essential, the pillar will not be triggered. Kill the follower using any means (despite what the Priestess says, you do not have to use the Blade of Sacrifice). Once your follower is dead, Boethiah will use the body as a conduit to tell you and all of the cultists that she has a task for whomever is left standing after a battle to the death. This results in all the cultists attacking one another (and you). Be prepared for a tough fight, as they can be formidable opponents. If you have already killed all the followers of Boethiah, she will then possess the corpse of the last follower you slew and the quest proceeds as normal. See Notes. After making the sacrifice and killing all the cultists, Boethiah will again use a body as a conduit (it may not be the same one) and tell you she needs a new champion. To become the new champion you must kill the old champion and his bandits at Knifepoint Ridge, northwest of Falkreath. Despite Boethiah's order to kill them stealthily, being detected does not result in quest failure or any other penalty. Nonetheless, most of the bandits inside the mine are busy with their backs to you and can be assassinated. A few are standing in pools of flammable liquid that can be ignited with fire spells. It's difficult to sneak up on Boethiah's Champion because of the direction he faces when sitting, but if you climb on top of his shack, you can drop down behind him. Once you defeat Boethiah's Champion, you must equip his Ebony Mail. Boethiah will then speak to you one last time, telling you that you are her new champion and giving you the old champion's Ebony Mail as your reward. Boethiah would have given you a second Daedric Quest in which you would have killed Solitude's Jarl Elisif the Fair. The quest was not included in the game but the data was left in the game files. It is possible to get the Blade of Sacrifice without having to start the quest by looting the dead body from the fight pit. You can also get more than one this way. It is possible to get up to nine Blades of Sacrifice if you have the "Misdirection" Perk by pickpocketing each of the 8 cult members before the sacrifice as well as collecting one from the member used for the voice. This will make the cult members fight with their fists instead of weapons. 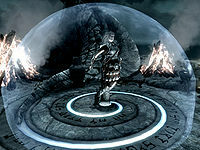 The Daedric inscription coiled around the base of the Pillar of Sacrifice is a line from Boethiah's Proving written backwards. It reads: "I am alive because that one is dead. I exist because I have the will to do so." One or more of the bandits in Knifepoint Ridge might start a fight with the old Champion if they get close enough to him to be hurt by the poison damage done by the Ebony Mail when they are searching for you. It is possible to kill the Boethiah Cultists before you offer a sacrifice. If you kill all of the cultists at the Shrine of Boethiah, Boethiah's Conduit (her spirit in the form of the last cultist you killed) will appear to you with a different dialogue. She will be slightly bitter that you killed all of her followers, but suggests you make a sacrifice in order to prove your worth to her. Sometimes you will not be attacked by a cultist and must find the book or go to the Sacellum to trigger the quest. After the follower is placed on the pole and sacrificed, they can be looted of their default armor 2x if quick enough. 1 after the sacrifice (before the voice initiates forced dialog), and 1 after the voice leaves the followers body at the fighting pit. If you refuse the quest and kill the cultists or something happens to cause Boethiah's current body to enter combat mode (such as a dragon attack), she will be stuck in the same conversational loop repeating the line "You've gotten my attention mortal, that is most unwise" when approached. ? To get around this, kill all the cultists and priests. If you sacrifice a Companion leader at the Pillar, the game may not register them as killed, breaking the radiant quests from the Companions. Though the follower dies and the quest for Boethiah proceeds as normal, the other Companion leaders don't acknowledge the death, and they still respond with "Aren't you already running a job for (name)?" when asked about work. ? If you kill the priestess before talking to Boethiah, one or two of the current fighters may become unkillable. ? Open the console and for each fighter that's unkillable, click on them and then type kill. The quest will proceed as normal once all the fighters are dead. On entering Knifepoint Ridge, possibly due to having been there before beginning the quest, you may be presented with a wall of Iron Ore blocking your path to the remaining bandits and the Boethiah Cultist, making the quest impossible to complete. A known workaround is to look at the bottom right corner of the wall of Iron Ore, where the option to mine a Corundum Vein will be presented. Mining this vein will pull you through the wall, allowing you to continue with the quest as intended. However this will only work once, so make sure you have completed everything before heading back up this path - as soon as you have walked through the location of the wall it will reappear, making the rest of the mine unreachable. You can use the mining workaround several times, so long as you cancel the mining action as soon as you pass through. The Miscellaneous Quest objective "Investigate the Boethiah cultist" may not ever be marked as completed, even after completing the main Boethiah's Calling mission. Reading the book after looting it from the body prevents this. 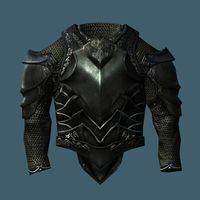 The Champion of Boethiah will re-equip his armor if he is killed and revived with Dead Thrall, which can be exploited for infinite gold and powerful armor for your followers. Upon talking with Boethiah your vision field may be stuck in the distorted oval it creates when talking to the daedric prince. Completing the quest might fix this. Opening the console and typing rimod 00106a73 or rimodcf might also fix it. Your follower's inventory will be reset upon being used by Boethiah, and any items you gave them will be removed. The Champion of Boethiah may disappear after being killed. His body passes through the ground beyond the wall, making it impossible reach it and retrieve the Ebony Mail. By using the console commands prid 000834FF followed by resurrect the champion will be resurrected but still be stuck in the ground. He will eventually free himself and can then be killed again (e.g. with the console command kill). When Boethiah's conduit is killed after she's done "using it", you may incur a bounty. If you use beast form and eat the Champion of Boethiah the game may glitch making it impossible to collect the Ebony Mail. ? 1 I found a book that mentioned a cult of Boethiah in the mountains near Windhelm. 5 I have discovered a shrine to Boethiah in the mountains near Windhelm. 10 I am to lead someone to the Shrine of Boethiah, instruct them to touch the Pillar of Sacrifice, and once trapped by it's [sic] magic, slay them. If I do this Boethiah will appear. 15 Boethiah has appeared using <Alias=DeadFriend>'s corpse as a vessel. She will give a special task to whichever of her cultists are left alive after we fight to the death. 20 Boethiah revealed herself to me. I am to slay her previous champion, and having done so, don the Ebony Mail. So doing, she will make me her champion. 40 I have proven myself to Boethiah, and she has made me her new champion. DA02: 0, 4, 6, 7, 9, 11, 12, 21, 41, 60, 70, 80, 81, 200. On the PC, it is possible to use the console to advance through the quest by entering setstage DA02 stage, where stage is the number of the stage you wish to complete. It is not possible to un-complete (i.e. go back) quest stages, but it is possible to clear all stages of the quest using resetquest DA02. This page was last modified on 28 August 2018, at 18:52.